(Kitco News) - Although the European economy has gotten a boost from lower oil prices and a weaker euro, one famed economist says there are still many challenges to be faced to ensure a sustainable recovery, and Germany may be the key. In his latest Project Syndicate editorial, Nouriel Roubini lists five looming obstacles the eurozone needs to tackle to ensure growth. For starters, Roubini highlighted Germany’s current account surplus, which some forecasts call for it to rise to 10% of the country’s GDP because of the region’s weak currency and low borrowing costs. “Germany needs to adopt policies – fiscal stimulus, higher spending on infrastructure and public investment, and more rapid wage growth – that would boost domestic spending and reduce the country’s external surplus,” he said. 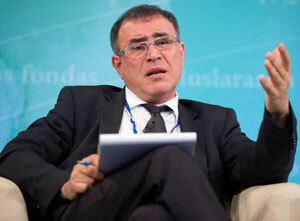 According to Roubini, Europe’s recovery is also hindered by an incomplete monetary union, which requires the development of “a full banking union, fiscal union, economic union, and eventually political union” to ensure long-term viability. “But the process of further European integration has stalled,” he said. Other challenges the region is facing include political risks, mainly in Greece but also in Spain, as well as debt sustainability. While the European Central Bank’s policies help maintain low borrowing costs, private and public debt in peripheral countries is rising as nominal GDP barely increases, Roubini said. “Thus, debt sustainability will remain an issue for these economies over the medium term,” he added. “Snail’s pace” structural reforms, which Roubini said is holding back potential growth, and Europe’s proximity to unstable neighboring regions, like Russia and the Middle East, are also major concerns for the region.